I pride myself that I have never stolen anything in my whole life. 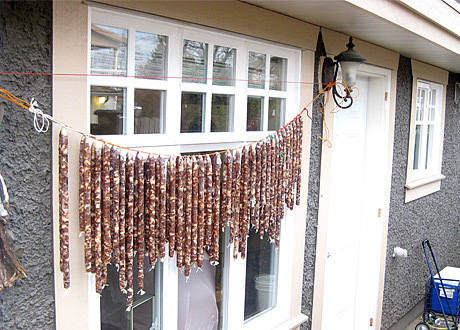 But every morning as I walk my daughter to daycare I pass a house and see sausages just hanging outside the window. I am now tempted to steal every single morning! I want to take one, fry it with eggs, fresh basil, cracked pepper and a dash of hot sauce. I have never seen sausages hung outside before. Fellow Foodists, is it ‘normal’ to hang sausages outside? I would knock on their door and ask but there seems little life inside the house at 7am every morning and I’m sure they wouldn’t appreciate being woken up to be asked about their sausages. My 80ish year old neighbor says that one of more important things to curing sausages like this is to hang them in a place that has good air-flow.